Teach Yourself Panjabi (comprising a coursebook and audio support on a double CD) has been designed for the absolute beginner who may or may not have studied a language before. The course will be useful to people who want to learn Panjabi in order to speak with their Panjabi friends and relatives, to communicate with Panjabi communities in relation to their work, to learn about aspects of Panjabi culture and society or to travel to the Panjab itself. The course will also be useful to those who already know a little Panjabi but who may not have the confidence to speak, or to those who are fluent but need to learn to read and write the Gurmukhi script. - the first part (units 1-10) is specifically designed for those who want to learn the basics of grammar and vocabulary in order to be able to communicate in a simple manner and to read and write simple sentences. - the second part (units 11-16) will help you expand your knowledge of spoken Panjabi further and become proficient in the Gurmukhi script. Overall, the course introduces you to a wide range of vocabulary and covers the basic grammar of Panjabi. By the end of the course, you will be able to understand the spoken language to communicate in Panjabi in a number of everyday situations and also have a level of understanding of the written language to begin to read newspapers and write letters. 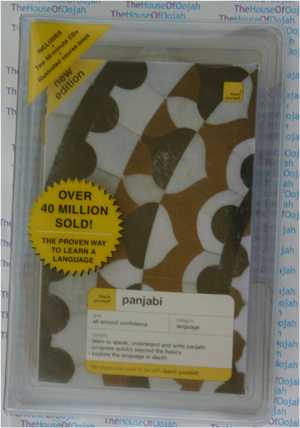 Comprehensive - all you need to be able to speak, understand, read and write Panjabi.Lots of practice - there are exercises to help you check your progress and the audio material will help you perfect your pronunciation and listening skills. Script - become proficient in the Gurmukhi script. Practical - cover the vocabulary and grammar you need: if you want a basic knowledge of the language work through the first part of the book only, or go on to the later units if you want to expand your knowledge. Did you study in Jalandhar? Our cloth is the best! Surjit Singh Kalra is founder and director of the Panjabi Language Development Board in the UK. He retired in 1992 as Head of the Community Language Service for Birmingham Education Authority. Navtej Kaur Purewal is a lecturer in sociology at the University of Manchester. She teaches Development and South Asian Studies. Sue Tyson-Ward was formerly Subject Officer for Community Language examinations at Cambridge Examinations Board and is now a language consultant and teacher in adult education. Panjabi is an Indo-Aryan language spoken by inhabitants of the historical Punjab region (now split between India and Pakistan) and their diasporas. Speakers include adherents of the religions of Islam, Sikhism, and Hinduism. It has over 90 million native speakers according to the Pakistan census of 1998 and the India census of 2001, which makes it approximately the 11th most widely spoken language in the world. Along with Lahanda and Western Pahari languages, Punjabi is unusual among modern Indo-European languages in being a tonal language. The written standard for Punjabi for at least 300 years has been based on the Majhi dialect, the dialect of the historical region of Majha, which spans the Lahore, Sheikhupura, Kasur, Gujranwala, and Sialkot Districts of the Pakistani Province of Punjab and Amritsar District and Gurdaspur District of the Indian State of Punjab. Punjabi is the most common language of Pakistan. Punjabi is spoken as first language by 45% of Pakistanis. About 70% of Pakistanis know how to speak Punjabi. Punjabi is the Provincial language of the Pakistani Province of Punjab. Punjabi is spoken as first language by 3% of Indians, esp. the followers of Sikhism. Punjabi is the official language of the Indian state of Punjab and the shared state capital Chandigarh. It is one of the official second languages of the states of Delhi and Haryana. Punjabi is also spoken as a minority language in several other countries where Punjabis have emigrated in large numbers, such as the United States, Australia, the United Kingdom (where it is the second most commonly used language) and Canada, where in recent times Punjabi has grown fast and has now become the fourth most spoken language. Punjabi is the preferred language of most Sikhs (most of their religious literature being written in it) and Punjabi Hindu and Punjabi Muslims living in Pakistan. It is the usual language of Bhangra music, which has recently gained wide popularity in other parts of South Asia and abroad. Punjabi is a descendant of Sauraseni, which was the chief language of medieval northern India. Punjabi emerged as an independent language in the 11th century from the Sauraseni Apabhramsa. However, the literary tradition in Punjabi started with Fariduddin Ganjshakar (Baba Farid) and Guru Nanak Dev ji, the first Guru of the Sikhism. Guru Arjan Dev ji, the fifth Sikh Guru, compiled Sri Guru Granth Sahib. A substantial portion of the Guru Granth Sahib is written in Punjabi, although it is interspersed with Hindi languages (such as Brajbhasha and Khariboli), and also contains Sanskrit, Persian and Marathi words. Guru Gobind Singh ji also composed Chandi di Var in Punjabi, although most of his works are composed in other languages like Braj bhasha and Persian. Between 1600 and 1850, Sikh, Hindu and Muslim Sufi writers composed many works in Punjabi. The most famous Punjabi Sufi poet was Baba Bulleh Shah, who wrote in the Kafi style. Waris Shah's rendition of the tragic love story of Heer Ranjha is among the most popular medieval Punjabi works. Other popular tragic love stories are Sohni Mahiwal, Mirza Sahiba and Sassi Punnun. Shah Mohammad's Jangnama is another fine piece of poetry that gives an eyewitness account of the First Anglo-Sikh War that took place after the death of Maharaja Ranjit Singh. The Punjabi identity was affected by the communal sentiments in the 20th century. Bhai Vir Singh, a major figure in the movement for the revival of Punjabi literary tradition, started insisting that the Punjabi language was the exclusive preserve of the Sikhs. The Hindu and Muslim Punjabis began to assert that their mother tongue were Hindu and Urdu respectively. After Partition of India in 1947, Punjabi was sidelined by Urdu in the Pakistani Punjab. With the Partition, the Indian Punjab became Hindi-majority. The movement for a Punjabi Suba led to trifurcation of Indian Punjab into three states: Punjab (India), Haryana and Himachal Pradesh. Punjabi was made the official language of Punjab and Delhi (NCR) and has flourished greatly. The famous Indian Punjabi poets in modern times are Mohan Singh, Pritam Singh Safir, I C Nanda, Balwant Gargi, Shiv Kumar Batalvi, Surjit Patar and Amrita Pritam (winner of Jnanpith Award).